Follow Jesus through the last day of His life and discover how it transforms not only your future but also your present. Some people see Jesus' death as a historical footnote, buried in the past. Christians understand it is much more than that, and know it has transformed their future. But often we don't realise how much Jesus' last day should change our present, too. Walking readers through Luke's Gospel, US pastor and well-known author Mike McKinley looks at the events of the last day of Jesus' earthly life. At each point, he pauses to marvel at the love Christ has for His people; and shows how Jesus' people can learn from His passion, His care, and His integrity. This unique book is perfect for both new and mature Christians. While great for reading at any time in the year, it's particularly helpful to read during Lent or Holy Week. 5. Away With This Man! Whether you're just getting to know Jesus or have known already him for years, you will be challenged, encouraged, and emboldened by Passion. This excellent study from Mike McKinley will help you personally understand why Christ's final day is the hinge of history. 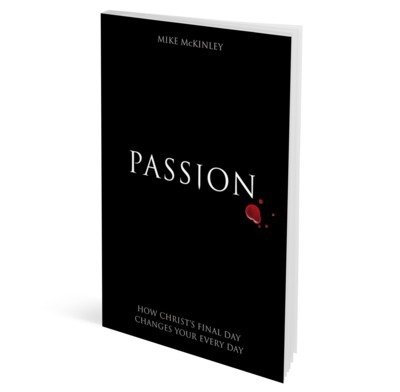 Mike McKinley has wiped the dust off the familiar events of Christ's final day, showing just what a difference the cross makes to everyday life. Warning: his insights are like nails! Here is a faithful, fresh perspective on the gospel story. It makes insightful connections between the climactic moments of Jesus' life and the everyday events of our own, and encourages us to look in the mirror at our lives in the light of his. A truly fabulous and humbling book. Easter is often in the shadow of Christmas but the Passion makes the climax of our Lord's life so heartbrakingly real. I cannot imagine anyone reading Mike McKinley's book to come away unmoved and unaffected by the deep love that our Saviour has for us. The unrelenting passion that Jesus has for each of us is so profoundly explained together with biblical quotes and beautiful poetry in the pages of this enchanting book. This book was recommended as a suitable lent book I agree having read it. It is easy to read with very good teaching particularly liked thoughtful questions at end of each chapter and hymn to read. Looks at the last day of Jesus life and briefly touches on the resurrection. Could read any time not just lent. Although being very familiar with the Easter story, I was still inspired afresh by this book. Mike McKinley's insights and writing were engaging and very readable, and were food for both the heart and mind. A great journey through Luke's account of the sufferings, death and resurrection of Jesus. Each chapter starts with the relevant part of Luke, then opens it up and applies it in very practical and searching ways to life as a follower of Christ today. Very edifying and encouraging; well worth a read!